Fun fact: Finding Nemo was the ONLY Pixar film I never saw at the cinema. I can’t remember why that was, but when I finally caught up on DVD, I was less than impressed. Despite being hugely popular, the film didn’t make much of an impression on me. It was a little too…generic. So I wasn’t at all excited when this sequel was announced (particularly after being unfortunate enough to see Pixar’s last sequel, Cars 2). But lo and behold, Finding Dory is excellent. Instead of the usual father/son story we’ve seen time and time again, this undersea adventure is all about Ellen DeGeneres’ Dory – a fish with a learning difficulty. In fact, when it comes to characters with disabilities, Dory is up there with Venellope from Wreck-It Ralph. From the opening scenes, where we see Dory’s childhood, this film grabs you right in the feels. I mightn’t be a parent, but I instantly empathise with Dory’s parents’ pain as they watch their child fail to keep up with the world around her. Pretty soon, we’re off on another journey across the ocean, and whilst this may seem like mere repetition, I can only tell you that this is a much more powerful story. 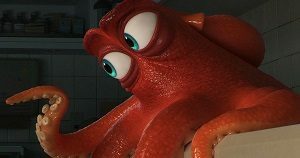 Dory’s quest of personal discovery sees her meeting three other characters (played by Ed O’Neill, Kaitlin Olson and Ty Burrell) who all have their own physical challenges too. DeGeneres is fantastic in the lead role, and one of the terrible things about her talk show success was always the fact that we’ve been robbed of her presence on the big screen. Pixar have done funnier films, to be sure, but this screenplay is top notch. The setups and callbacks are perfect – you don’t see them coming, but you kick yourself when they’re revealed because they seem so obvious in retrospect. As with the first film, the animation doesn’t make a big impression. There’s nothing bad about it, but there’s nothing that truly wows you either. The running time is a speedy 97 minutes and as with most of Disney/Pixar’s animated output, there are no lulls. There have been funnier Pixar films, and there have been more action-packed Pixar films, but Finding Dory really nails the narrative. It’s an emotional journey, and a triumphant and touching story of a character who was simply a comedic sidekick in the first film. Colour me impressed. This entry was posted in Film Reviews and tagged Action/Adventure, Animation, Childrens, Comedy by Stuart Wilson. Bookmark the permalink.